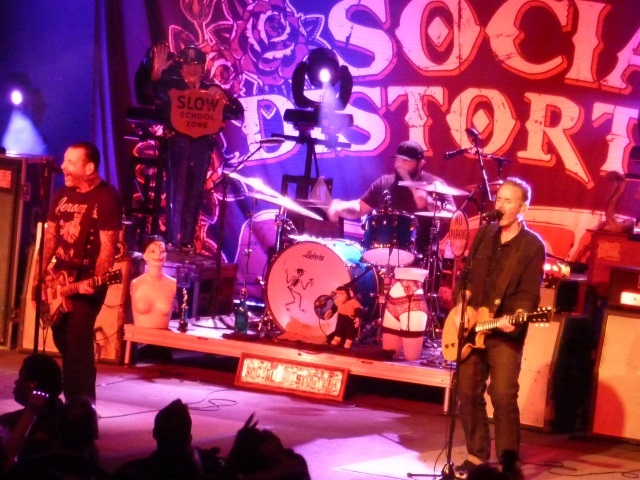 Social Distortion brought a full keg of piss and vinegar to their sold out performance on Saturday night at the Roseland Theater in Portland, OR as part of the band’s tour commemorating 25 years of their self-titled album. 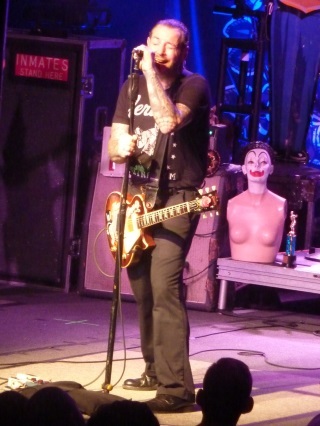 Fronted by everyone’s favorite punk rocker Mike Ness, Social Distortion rocked for nearly two hours playing 18 songs including the entirety of the album that brought main stream success in 1990. They wasted little time in delivering the goods opening the show with the first song off the album “So Far Away” and followed the tract list sequentially skipping only “Ring of Fire” saving it for the end of the night. 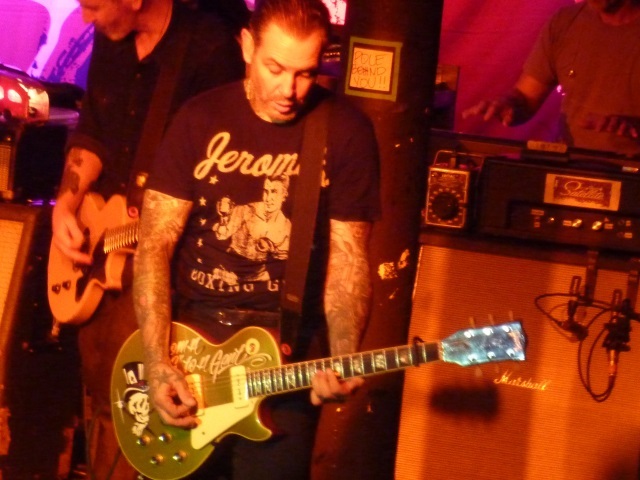 Social Distortion executed each song with fiery intensity stopping only once between “Ball and Chain” and “It Coulda Been Me” so Ness could give the audience some background on how the album came together. It was something to witness (and hear) however, when the band started the fantastic “Story of My Life,” the audience exploded. Then Ness dropped those opening lyrics anyone over the age of 18 knows too well – “High school seemed like such a blur” – and he had a 1,000 of the Social D faithful as background singers for the rest the likely anthem for many who were of that age back then. The crowd pretty much had Ness’ back throughout the first hour which is how long it took to perform the album. The band played with precision, sounded great, except for the opening two songs when Ness’ mic came off a bit hot, and barely came up for air as they shredded through each song at a blistering pace. Ness and rhythm guitarist Jonny “2 Bags” Wickersham each took turns in the spotlight and really classed up “Let it Be Me,” “Ball and Chain,” “She’s a Knockout” and the final tract “Drug Train” with extended solos and jamming around with bassist Brent Harding. The band took a bit of a breather once they finished the eponymous album as if they were warming up prior to a practice session with Ness soloing a bit and addressing the crowd calling it “Buying time” before launching into “Cold Feelings” from 1992’s Somewhere Between Heaven and Hell. Then they really slowed the pace playing The Rolling Stones’ “Wild Horses” which Ness said he first heard when he was five years old. The rather active mosh pit up until this point also took a breather. They followed with Hank William’s “Alone and Forsake” which Social Distortion covered on their latest album Hard Times and Nursery Rhymes now four years old. They kept the pace slow with “This Time Darlin’” the penultimate tract off Somewhere Between Heaven and Hell then brought back the fury with the great “Far Behind” an ode for anyone who has ever been stabbed in the back. 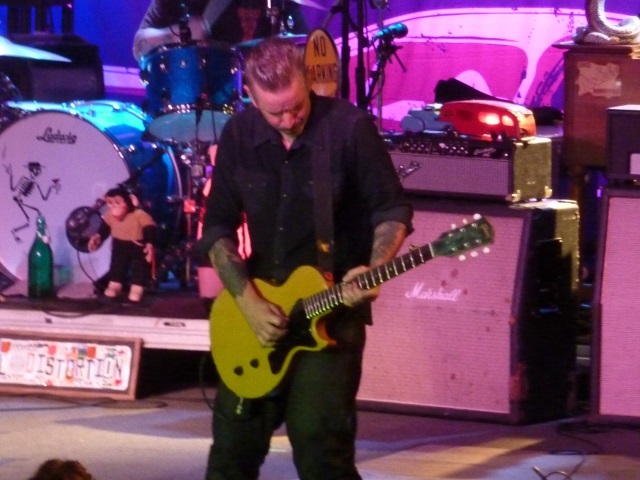 The encore included “Don’t Drag Me Down” off White Light White Heat White Trash and finally Johnny Cash’s famous “Folsom Prison Blues” then “Ring of Fire” which completed the entirety of the anniversary album and, could be argued, is now a Social Distortion song. Ness, 53, was on a different level this evening. He was tireless and seems to have hit a new level of musicianship both on the guitar and his vocals. The man with the rough punk rock vocals actually hits high notes. It’s been 25 years and surely there’s been some tears (the death of co-founder Dennis Danell hurt) but Social Distortion’s self-titled album put the band in the stratosphere, albeit quite briefly, and Ness rarely looks back and certainly didn’t on Saturday. Prior sets sometime include a song off 1988’s Prison Bound though not often and usually just one tune off the band’s first full-length album Mommy’s Little Monster, 1982’s effort which cemented the band’s reputation in the punk scene. Danell, who died of a brain aneurysm 15 years ago, was replaced by the very adept Wickersham and Brent Harding came onboard with his bass more than 10 years ago. Ness has found a new core for the band which works very well though he has replaced the drummer several times in the last decade a spot now occupied by David Hidalgo, Jr.
Ness said when he wrote Social Distortion rules had formed out of the 80s punk rock scene that tried to define what is and what isn’t a punk album. Punk rock is a rebellion, he said, and he didn’t want to follow any one’s lead or whatever ideals dictated such a record though admittedly he wasn’t sure if anyone would like it.